When you say Tuscany, in the vast majority of cases, the imagination flies right away to the magical and picturesque landscapes consisting of an isolated farmhouse, perched on a hill, whose driveway is lined with cypress trees. 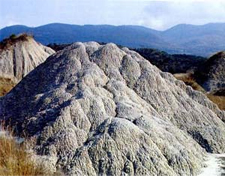 Our area is often described as a "lunar landscape" due to some areas with "biancane" like the one that appears in the picture. Actually the Crete Senesi are much more, because it has always been inhabited by a people whose origins date back to the hard-working Etruscans, which is still a trace in some cities and in the Civic Museum of Asciano. For those who come here only for a short vacation or live there permanently, the Crete offer many opportunities: cultural ones, beautiful landscapes, gastronomic and commercial ones. In this portal you will always find the information you seek, about places where you can taste local unique products or buy something distinctive or just cheap. For residents, there is also the opportunity to discover many places and works of art that can be worth a short trip, perhaps accompanied by a visit to some local producers.